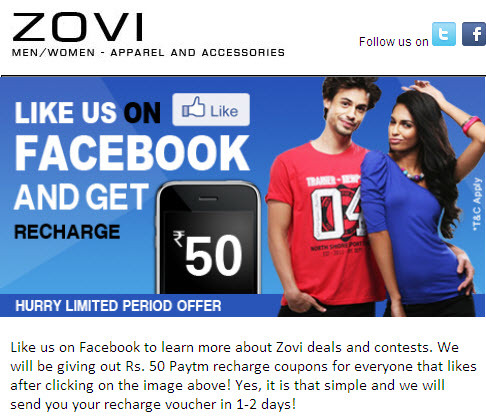 Zovi is giving Rs 50 PayTM Mobile Recharge without any conditions for all those who like them on facebook. They have sent a mail to all their registered users that if they like their facebook page by clicking on a unique like they will get PayTM recharge within 1-2 days. How to get Free Rs 50 Recharge for Registered users? How to get Free Rs 50 Recharge for Non-Registered users? Get your voucher within 1-2 days. Nivea Started a contest on facebook where you can win Grand Prize worth Rs 25000 and this is not all. You can win weekly prizes worth Rs 2500 and 2000 Nivea Whitening Deodorants to be won. Hurry before all prizes get over. How to participate to win Nivea Whitening Deodorants and other prizes? Go to : "Click here to get started"
Note: This contest is only for women's. Click here and start participation.